Further evidence of the new Fiat 500 TwinAir’s industry-leading environmental credentials has been highlighted following the recent Transport for London (TfL) decision to remove the city’s Congestion Charge for sub-100g/km CO2 cars. The ruling means that the 500 TwinAir, which emits just 95g/km CO2, will be one of the few petrol cars entitled to travel across the capital without incurring the charge. The new 100 per cent discount scheme for greener vehicles comes into force from 4 January 2011. 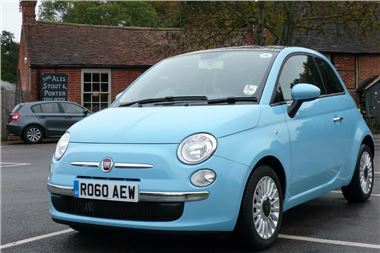 Fiat 500 TwinAir owners will simply have to register their car for an annual payment of £10. The move is good news not only for private owners of the new Fiat 500 TwinAir, which was launched this week, but for fleet operators looking to save business costs too. And with fuel consumption figures of 68.9mpg (combined) and no vehicle excise duty (VED) to pay, the Fiat 500 TwinAir represents excellent value for money in terms of owning and running costs. The new Fiat 500 TwinAir range starts at £10,665 (OTR) for the TwinAir Pop and rises to £16,065 (OTR) for the convertible 500C TwinAir byDIESEL.